Today, Monday, June 23, 2014 Tomas will play his first match at Wimbledon. He will play against Victor Hanescu of Romania, currently ranked ATP 103. They have played against each twice before, on clay and also on grass. Tomas won both encounters. The match will be the first on Court No. 2, play is scheduled to start at 11:30 a.m. GMT. Sixth seed and 2010 runner-up Tomas Berdych opened his campaign with a 6-7(5), 6-1, 6-4, 6-3 victory over Victor Hanescu. Hanescu was attempting to record his 200th tour-level match win. 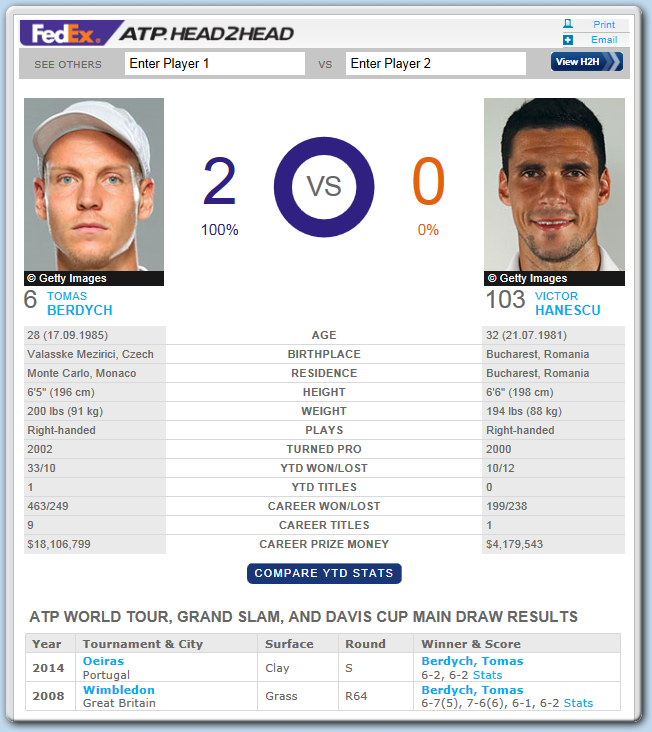 Tomas Berdych is a good enough player on grass to have been runner-up at the 2010 Championships, having beaten Roger Federer and Novak Djokovic en route, and to be seeded sixth at this year’s tournament. But he made heavy work indeed, especially in the first set, of defeating Romania’s Victor Hanescu, who is ranked just outside the world’s top 100 and has not won a grass court match for three years. Eventually, in four minutes short of three hours on No. 2 Court, Berdych came through 6-7(5) 6-1, 6-4, 6-3 but he will need to capitalise on the break points his hard work created if he plans to progress deep into the Gentlemen’s Singles this year. The Czech had 25 break points in all and the fact he failed on 20 of them clearly nettled him, as it should have done. The fact that he struck 22 aces and his 75 winners in all will help to overcome the disappointment of those squandered break points. The two had clashed only once previously on grass, at Wimbledon six years ago, and on that occasion Hanescu also captured the first set on a tie-break before losing in four. Now, at the age of 32, it seemed unlikely he would erect much of a barrier to Berdych’s progress but, assisted by nine uncaptured Berdych break points he won that opening set in 59 minutes. That setback clearly upset Berdych and there was a small spat at the start of the second set when he struck a shot hard at Hanescu. The ball flew out but he (in vain) argued with the umpire that on its way it had touched his opponent. To his professional credit, Berdych put the issue behind him with a flurry of aces and squared the match. But Hanescu was to prove a dogged and difficult opponent, clinging on to his own serve in games full of deuces and break points. The Romanian led 4-3 in the third set and it should have been 5-3, but it was his turn, a rare event this, to miss two break points, one of them saved by a thunderous Berdych ace. That crisis averted, Berdych won the next two games to go two sets to one ahead and once he had captured the Romanian’s serve in the opening game of the fourth set the road into the second round opened up for him. Tomas Berdych celebrates beating Romania's Victor Hanescu during their men's singles first round match on day one of the 2014 Wimbledon Championships at The All England Tennis Club in Wimbledon, southwest London, on June 23, 2014. Berdych won 7-6, 6-1, 6-4, 6-3.